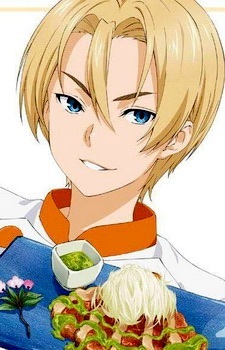 He is a student of Tootsuki Culinary Academy whom is a self-proclaimed rival to Yukihira Souma. Like Souma, Takumi's vast experience in the kitchen during his youth has made him one of the best chefs in his family restaurant, Trattoria Aldini in Italy. Similar to Souma's style of cooking, he is considered a culinary genius and resourceful student whom use various ingredients to create a wide variety dishes other than his forte culinary skill. It is also claimed that Souma's ideals and ambition is the sole reason Takumi has such strong tenacity and determination to block Souma's progress to become a top chef, making him one of Souma's arch-rival's in the very academy he enrolled in. With the pride of his Italian culinary expertise, Takumi takes his signature cooking style very seriously by making every style he uses as refined as he can. Like Souma, Takumi is very resourceful and able to adapt to use any ingredient to make a refined dish. Like most of the students in the academy, Takumi is prideful of his family restaurant and thinks his cooking style as flawless to anyone. At the same time, Takumi works hard to improvise his skill and to enhance the elegance of the dish, using both his vast knowledge of ingredients and strong will to do such signature dishes without failing his expectations. Despite his prideful and boastful personality, Takumi is a chef of honor and valor who refuses to use cheating to earn his victory. As an honorable chef, Takumi would prefer a clean match so he can see the true potential of his rival. Takumi is also rather sensitive about losing, particularly to Souma whom he sees his skills as a threat to his life in the academy. He is also has an interiority complex because of the fact that he must succeed no mater what and he can't let anything stand in his way, even if he clearly knows about his fears of losing. Due to that fear, Takumi is constantly honing his skills and has a philosophy that winning is everything, especially when confronted with bitter and strong rivals (such as Souma). Most of Takumi's styles of cooking are Italian. In certain cases however, Takumi managed to convert his Italian dish into another kind of regional cuisine with his vast knowledge of the food and cooking method, along with his unique style. Due to that advantage, Takumi could replace any of his Italian cuisine ingredients in an alternative way to create any style of cuisine he wishes to create the non-Italian cuisine. Thanks to his past kitchen experience and rigid training under his family restaurant, Takumi mastered almost every cooking tool, such as a Mezzaluna, a two handle cooking knife which is used by the professional Italian chefs, with incredible speed to make the cutting neat as the main art of his cooking method.